A YEAR AGO, when the Central government refused to hand-over the Khandadhar hills, Odisha’s third largest iron ore reserve, to the South Korean company POSCO, as a captive source for its proposed $12 billion steel plant in Jagatsighpur, everybody rejoiced. They believed the refusal would save one of the state’s richest sal forests and catchment areas of two major rivers from extinction. But for the 30,000 people, including the reclusive Pauri Bhuyan community, living in about 100 villages around the Khandadhar hills in Sundargarh and Keonjhar districts, the trouble is far from over. Though POSCO is out of the picture, mining activities in the entire region will now be undertaken by the state government-owned Odisha Mining Corpo-ration Ltd (OMCL). The public sector under-taking has already been mining at Kurmitar mine in the region (see ‘Unchecked extrac-tion’) for the past five decades and has damaged the ecologically sensitive area beyond repair. 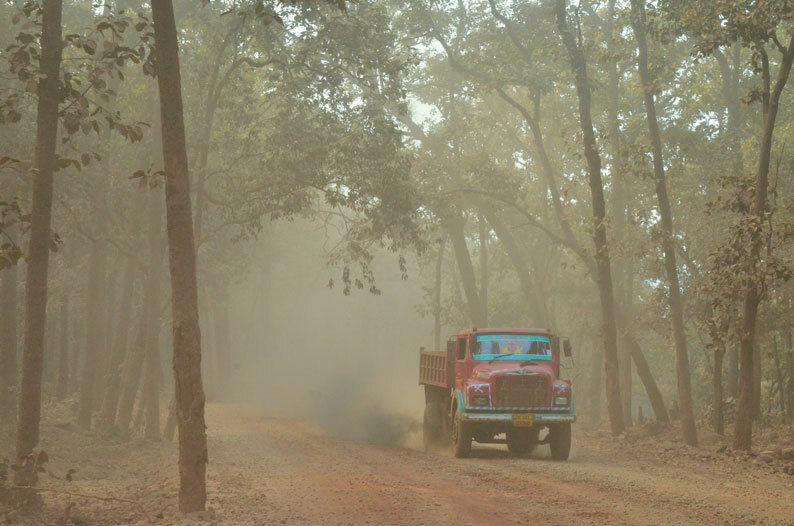 Members of Khandadhar Suraksha Samiti, a coalition of 40 pancha-yats in Sundargarh district, say that once the entire region is mined, villages, forests and water resources within the 10 km radius of the mountain will be wiped out. On January 26, the Khandadhar Suraksha Samiti held a protest against the diversion of the mountain range and its surrounding areas for mining. A drive to Saraikuda (see ‘Unchecked extraction’), a village whose only access road passes through the Kurmitar mine, gives a glimpse of what mining has done to the region. Dark red dust blurs everything, from roads to houses to trees. Trucks ferrying iron ore to the railway station race against each other through the dusty roads across the mountainous terrain. “Till about five years ago, there was enough water in our streams for drinking and farming throughout the year but now these streams carry mine waste from the mountaintop,” he adds, pointing at the towering presence of the mining rigs on the mountaintop where Kalinga Commercial Corporation Ltd (KCCL) mines the hills. KCCL has been undertaking mining opera-tions for OMCL in the Kurmitar mines, the only operational mine in the Khandadhar hills, since 2004. Khandadhar has a number of big and small waterfalls that originate from aquifers in the mountain and give birth to two major rivers—the Brahmani and the Baitarani. Mining activities are a major drain on the water resources. Even the majestic 55-metre-high Khandadhar waterfall is under threat. The waterfall is the only water resource of around 20 villages, including Saraikuda, and a major tourist attraction. Village residents say OMCL is drawing water from the head of the waterfall and this has resulted in a drastic reduction in the flow. 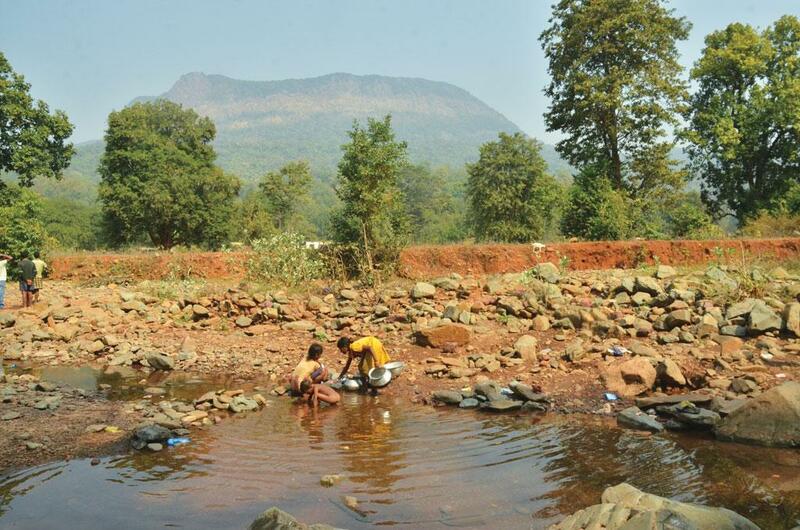 “If POSCO or anybody mines here, eight gram panchayats of the Lunipada block with more than 50 villages will be affected,” says Ashwini Mahanta, president of Vana Sura-ksha Samiti, a non-profit, and member of Khandadhar Suraksha Samiti. “If we do not take concrete steps, we will lose the water-fall,” he adds. Sarmistha Pattanaik, professor at the Department of Humanities and Social Sciences, Indian Institute of Technology, Mumbai, who has conducted research on the Pauri Bhuyan community, says as per the data provided by the local population, the waterfall supports 12 perennial streams in dry season and 26 streams during rainy season in the hills. It also plays a major role in maintaining the water table and serves as a major source to the Brahmani river and its tributaries. What has made matters worse is that OMCL has been indulging in severe over-extraction and this has hastened degra-dation in the region (see ‘Over-mined’). Data given on the website of KCCL shows that the company mined 8.47 million tonnes in its first year of operation against the target of 4.2 million tonnes. The production increased to 28.12 million tonnes in 2009, while the target by OMCL remained the same. In 2013, the Supreme Court-appointed M B Shah Commission said that the state has incurred losses to the tune of Rs 59,203 crore because of illegal extraction, sale and export of iron ore in Keonjhar and Sundargarh. When contac-ted, OMCL refused to comment on the issue. The situation is no different in Uskela village situated on the other side of the mountain. Sarpanch Bhajaman Dehury, who also belongs to the Pauri Bhuyan community, says OMCL is attempting to divert forest land for mining. “In 2014, we held three meetings—on September 24, October 11, and October 24—to discuss the diversion of forest land that we had got under the Forest Rights Act, 2006. On all three occasions our gram sabha rejected the resolution to divert land for mining,” he says. Bhajaman Dehury alleges that OMCL sought the help of Gurbari Munda, a gram panchayat member, and organised a mee-ting on November 10 the same year. In this meeting the gram sabha passed a resolution to divert forest land. He claims that of the 269 village residents, signatures of 139 were faked to pass the resolution. He also says that at least 10 persons have signed their name twice. “The signatures were collected in a blank register after telling the residents that they were being taken for the development of roads, water resources and ambulance services for the village,” he adds. Bhajaman Dehury has filed a police comp-laint and the matter is in court. Acquiring land, he says, was easy for mining companies because most of the land is under the state government. According to a study by Odisha-based non-profit Vasundhara, on an average 74 per cent of the land in Scheduled Areas of Odisha is categorised as state land, 48 per cent as forest land and 26 per cent as non-forest land. The study also says that three-fourths of all land in the predominantly tribal districts, including Keonjhar and Sundar-garh, belong to the state government. Apart from the problem of large-scale land diversion, Uskela is facing a water crisis. Its only water source, a rivulet called Tentali Khunti, which was once 10 m wide, has turned into a trickle. A thick deposit of mine waste covers the banks. “About 10 years ago they started dumping the mine waste into the rivulet,” says Bhajaman Dehury. Just like Saraikuda, most of the residents of Uskela work in farms or on construction and mining sites. Odisha’s State of Environment report, published by the Orissa State Pollution Control Board, indicates that mining of iron ore and manganese in these areas has caused heavy pollution. Water bodies in districts like Keonjhar and Sundargarh, that have been classified as Zone 1, face extensive pollution. During the rainy season, the water in rivers turns red and the level of total suspended solids reaches dangerous levels. 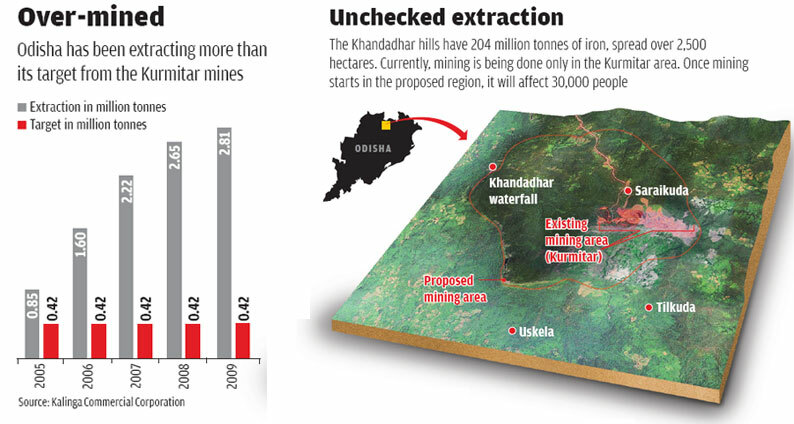 The only opposition from within the current government to mining activities in the Khandadhar range has come from Union Minister for Tribal Affairs Jual Oram, a member of Parliament from Sundargarh. According to Pauri Bhuyan community leader Bilua Nayak, several representations were made to the minister to save the remaining part of the Khanda-dhar from mining, following which he issued a statement on February 8 last year stating that mining may be permitted in the region only if did not cause any harm to the Khandadhar waterfall. The Union Ministry of Mines, however, did not agree with Oram’s opposition to mining in Khanda-dhar hills, which are included in the lease. In all this debate the only thing that is certain is the uninterrupted extraction from the mine by OMCL. POSCO to withdraw investment from Odisha?